One hundred fifty years ago . . . Christmas of 1864 . . . the last Christmas of the war between the states . . . the final Christmas of slavery . . .
Our Georgia-born Josephine is living in Brazoria County, Texas, where she had been a resident for about five years . . . by this time she is probably quite adept at assisting her Confederate surgeon brother-in-law in providing medical service to the locals . . . in March of that year, Josephine had married a young Confederate soldier . . . and by Christmas time she was most likely very concerned about her family back in Georgia, especially her paternal grandma . . . Sherman had just completed his march across Georgia . . . and had offered Savanah to the President as a Christmas present . . . from a music CD entitled God Didn't Choose Sides comes a song about Christmas in Savanah in 1864 . . . Meanwhile, elsewhere in Texas . . . the mother [Nellie] of Josephine's future daughter-in-law [Berta Mary] will be spending Christmas day in the home of her own mother-in-law [Mahala] . . . J.M. Hall will write about Christmas Day of 1864 as follows . . .
Sunday, December 25th, 1864. Houston County, Texas. Today Sam Sharp & I with the children in the little wagon, Nellie & the little woman [Margaret] in the buggy, all drove down to Mother's [Mahala] where we spent our Christmas. We had a fine dinner & a good eggnogg. We passed the day very pleasantly. Weather cloudy & rather warm. This Journal entry brings to mind the following ca. 1844 verse written by Lydia Maria Child (1802-1880), who was born and died in Massachusetts [birthplace of the Mom of the Keeper of this family history blog] . . . Mom's mother, Elizabeth, died in Massachusetts, but was born and raised in Maine, where multiple generations of her family had lived and died . . . by Christmas of 1864, Elizabeth's paternal grandma, Jerusha, had buried at least two young children, one in March and one in June of that year . . . Jerusha's husband, Atwood, was a member of the 27th Maine Volunteers . . . Elizabeth's father, Thomas, would not be born until 1866 . . . In April of 1864, Elizabeth's maternal grandma, Phoebe, had received a letter written by her father, William, from the New Orleans Barracks . . . he was back home by Christmas of that year after serving three years with the 30th Maine Regiment . . . Ancestors to the Keeper of this family history blog (in order of their mention) . . .
P.S. . . . also in 1864 . . . in New Paris, Ohio . . . Ben Hanby has recently written a new song for children . 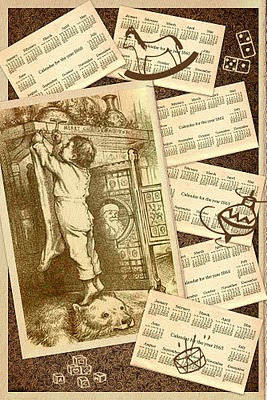 . . it is said that this was the first Christmas carol to actually mention Santa Clause . . . you will recognize this one in the following recording by George Strait . . .
On this date in our family history . . . the 8th day of December . . . in the year 1688 . . . the will of Basil Waring is probated in Calvert County, Maryland . . . this Basil is a 5th great-grandpa of Berta Mary Henry nee Sharp (1873-1955) . 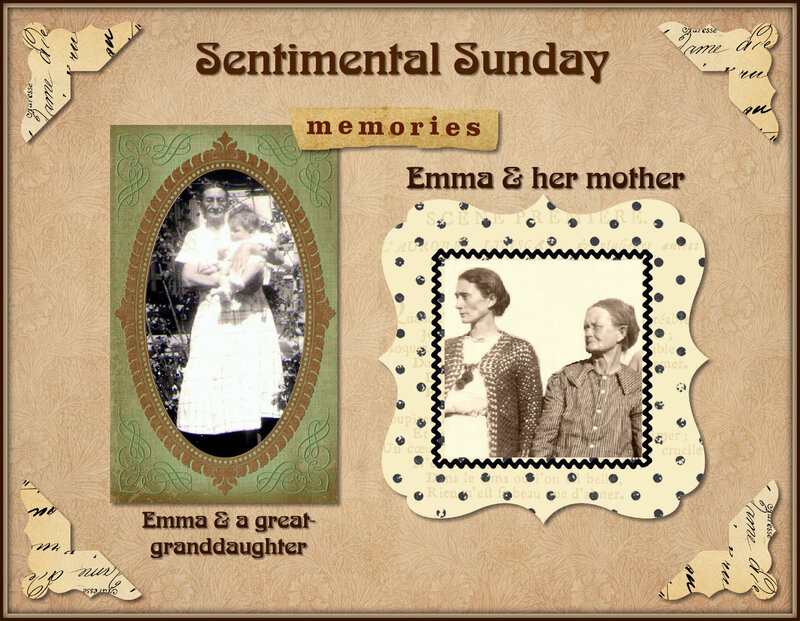 . . who is a great-grandma of the Keeper of this family history blog . . .
On this date in our family history . . .
in the year 1558 . . .
John Frost is born in England . . .
of this family history blog . . .
On this date in our family history . . . the 8th day of November . . . in the year 1834 . . . Grant Davis dies in Morgan County, Georgia . 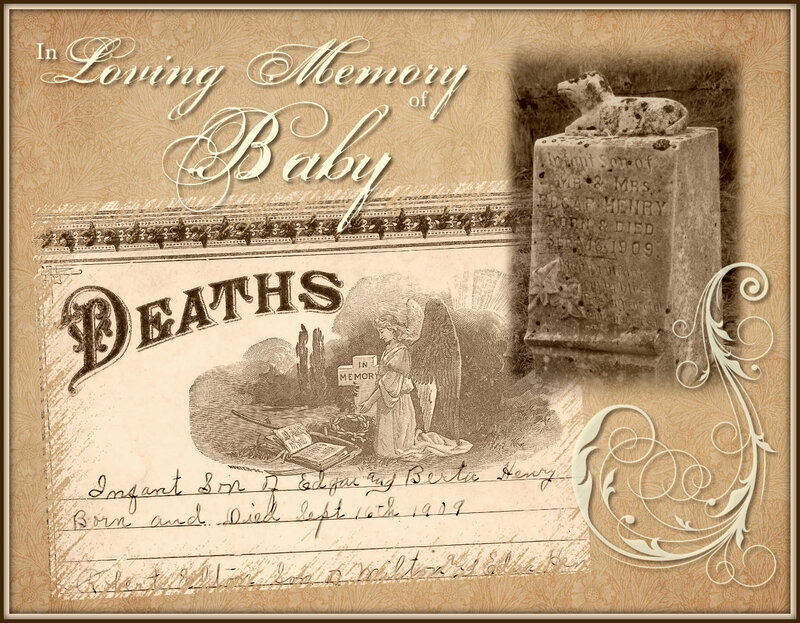 . . although his death occurs almost eight years before her birth, he is the paternal grandpa of Josephine Wingfield Henry nee Davis . 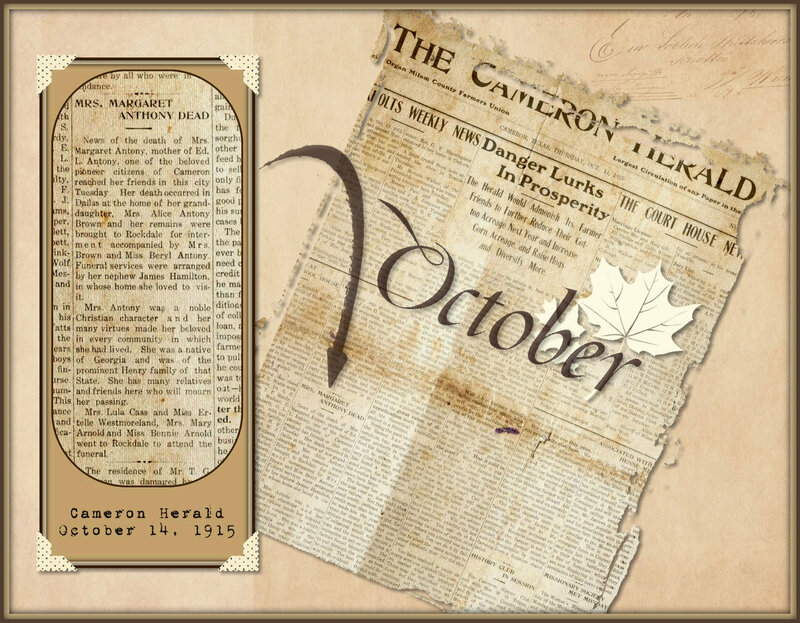 . . who is a 2nd great-grandma to the Keeper of this family history blog . . .
Grant Davis is laid to rest in a small family cemetery near Brownwood (southwest of Madison) in Morgan County . . . and on his tomb is inscribed the following . . .
A righteous man is here inter'd. Whose faith in all his works appear'd. A husband and a father dear. Belov'd by all who knew him here. Redeem'd by Christ, among the just. His spirit waits its rising dust. Howl fir tree for the cedar is fallen. Exactly thirty years later . . . and exactly one hundred fifty years ago today . . . Sherman is notifying his army that soon they will be leaving Atlanta to make a "March to the Sea" . . . beginning in mid-November, this military action will continue until Sherman's troops have cut a swath of destruction across Georgia and beyond . . . The Josephine mentioned above was born and raised in Morgan County, Georgia . . . which is located just a short distance east of Atlanta . . . and directly in Sherman's path . . . although she was already living in Texas by the time of the war between the states, Josephine had many kith and kin still living in the Morgan County area when Sherman began this trek . . . including her own paternal grandma, Nancy S. Tate Davis nee Anthony (1783-1871) . . . Regarding this land of my ancestors . . . according to a book by Louise McHenry Hicky . . . entitled Rambles through Morgan County, Georgia . . . While these were trouble filled times, [most of] Madison was spared from the ravages of Sherman's raid, because of an act of Representative Joshua Hill, later distinguished U.S. Senator, who resided here. Riding out from Madison, in quest of a wounded son, he made a point of meeting Sherman on the way to plead with him to spare the town. He had known Sherman in Washington, and due to the fact that he was one of the few southern congressmen who did not believe in secession, his plea had weight with the General, and [most of] Madison was bypassed. . . . The closing chapter of this same book says that . . . This is Gone With the Wind country . . .
and birds warble in the magnolia trees. . . .
was gone with the wind. . . . This is a time for remembering. . . . 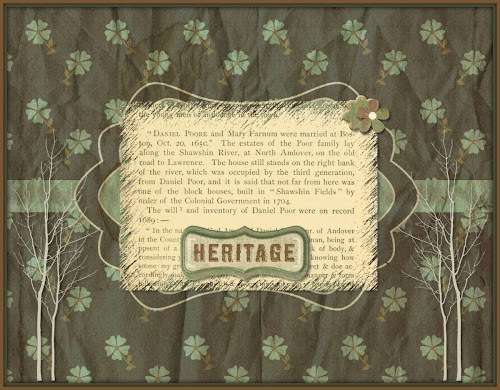 This blogpost was researched and prepared specifically for The Sixth Annual Great Genealogy Poetry Challenge over at cousin Bill's blog which is known as . . . West in New England . . .
On this date in our family history . . . the 7th day of November . . . in the year 1760 . . . 38-year-old Ruth Porter nee Foster dies in Boxford, Massachusetts . . . the following day, the 8th of November, would be the 16th anniversary of the day she had married Benjamin Porter in Andover, Massachusetts . . . this Benjamin and Ruth are 6th great-grandparents to the Keeper of this family history blog . . .
Benjamin's family history in Andover traces back to his 3rd great-grandpa, Job Tyler, who is said to have been living in Andover as early as 1639 . . . it has been said of this Job that . . .
"He was a rude, self-asserting, striking personality" . . . and that . . . He did not . . . "learn prudence very fast, but he was himself. . . . He did not shape his words to suit sensitive ears. He resented dictation and found it hard to restrain himself from what he wanted to do through any prudential policy. . . . From this old canvas there gazes steadily out, not an ideal but a very real personage, an out and out Yankee type." 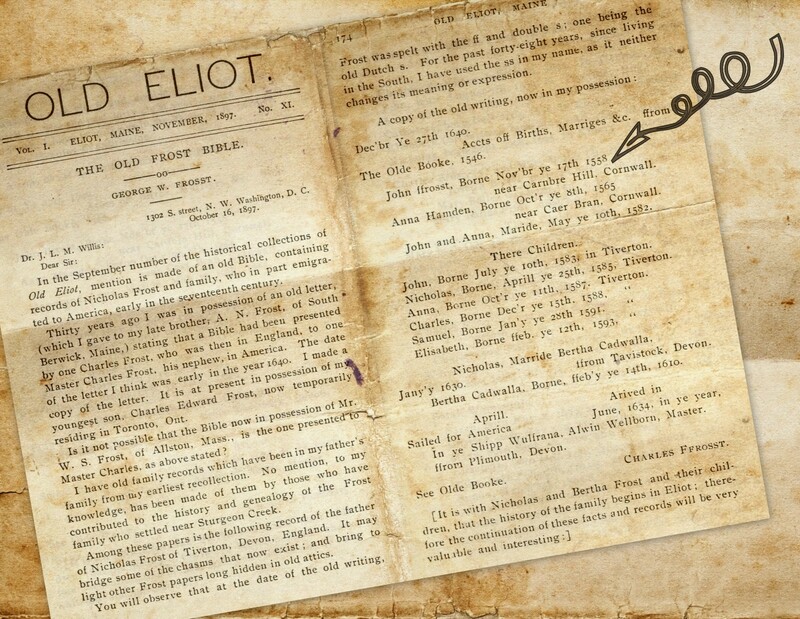 At a Tyler Family Reunion held in Andover on Wednesday, September 2nd, 1896, the gathering was called to the old North Parish Church, where Job Tyler anciently paid "minister's rates," and where his sons, Moses, Hopestill and John, were early communicants. At this gathering, songs were sung, organization business was taken care of, and genealogies and letters of regret, as well as poems were read . . . including the following excerpts from a lengthy poetic composition written in honor of our Job . . .
way down upon the coast. to the woods and lofty hills. and 'scape old country's ills. where Knowledge it is shown. a patient man, 'tis said. but yet, unknown to fame. and here resolved to stay. who lies there beneath historic ground. before the day is o'er. As is stated in that poem, Job's final resting place has been lost to the sands of time . . . thanks to those involved in the referenced gathering, our Job is now memorialized with a bronze tablet attached to a boulder in the Old North Parish Burying Ground in North Andover, Essex County, Massachusetts . . . that boulder was relocated from the old Tyler farm in West Boxford . . . and placed near the gravestone of his son, Moses . . . the memorial was dedicated five years following the above reunion . . . on the 4th day of September in 1901 . . .
On this date in our family history . . . the 27th day of October . . . in the year 1671 . . . it is recorded that Mary Mercy Pearson is born in Haverhill, Essex County, Massachusetts . . . and that her young mother, Mary Pearson nee Poore, dies at the time of her baby daughter's birth . . . the Mary who dies is a 10th great-grandma to the Keeper of this family history blog . . . the Mary who is born is a 9th great-grandma . . .
Samuel Pearson born 29-5 mo., 1648; married in Newbury, 6 Dec., 1670, Mary Poore; she died 27 Oct., 1671. . . . Child by wife Mary, baptized in our church: Mercy, b. 27 Oct., bapt. 10 Dec., 1671; m. 24 Jan., 1693-4, James Thurston of Newbury. On this date in our extended family history . . . the 21st day of October . . . in the year 1850 . . . T.J. Allen is acting as "the census taker" and is busy visiting residents of Milam County, Texas . . . this particular Mr. Allen just happens to be the third husband of Matilda Connell Allen Allen nee Roberts . . . who is an older sister of our Mahala . 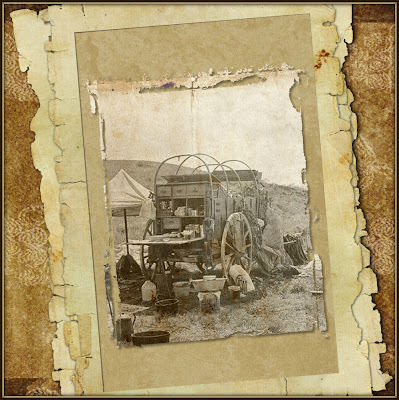 . . who is a 3rd great grandma to the Keeper of this family history blog . . . regarding the job of "the census taker" it has been written that . . .
a black book in hand. were tucked close by his side. wafting up through the air. As an enumerator for Milam County, one of the households Mr. Allen documented on this date contained the following family members . . .
she tucked back into place. the best she was able. the youngest is still two. soon filled up the page. just how long they'd been here. and he rode back toward home. As it turned out, by the time the next census is taken (1860), T.J. Allen has died of yellow fever while working as editor for The Galveston Journal . 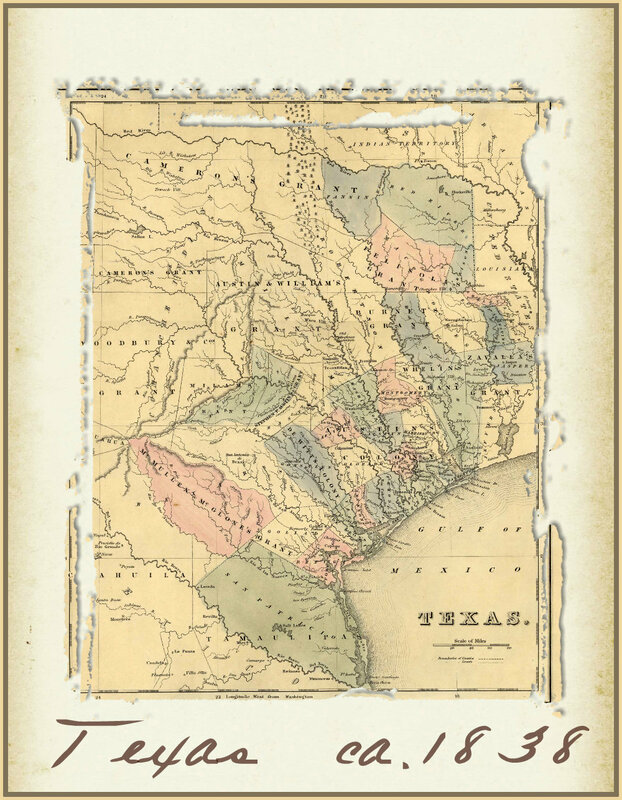 . . most of the members of this branch of the Goodnight and Daugherty family have moved on to other parts of Texas . . . and the above mentioned "Charlie Goodnight" has been a member of the Texas Rangers (1857) . . .
Before another census comes around in 1870, Charlie has been involved in a near state-wide round-up of feral Texas longhorn cattle that have been roaming free during the years of the war between the states . . . he has invented the "chuck wagon" . 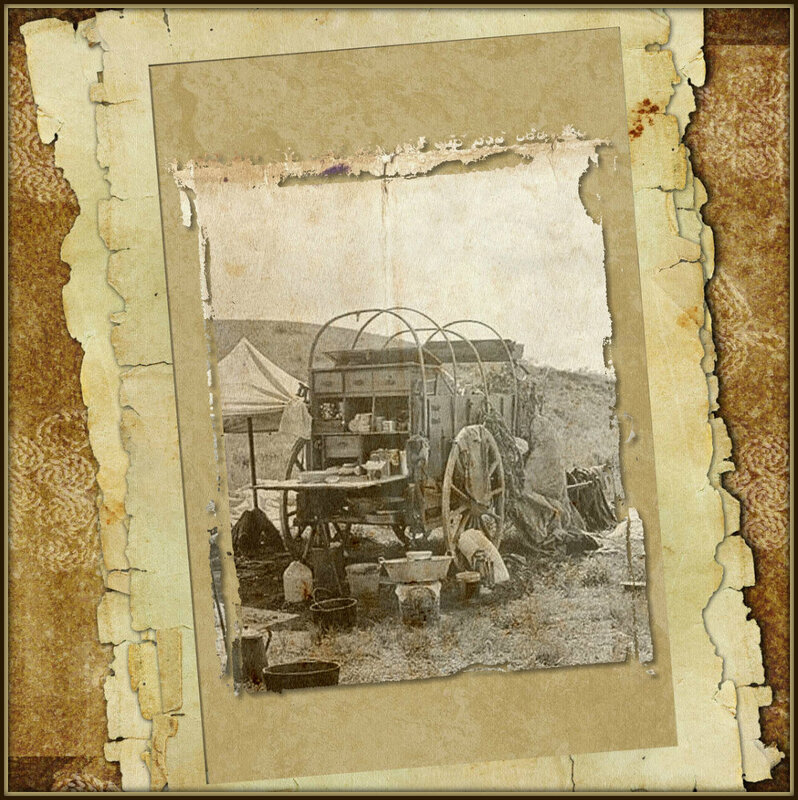 . .
and he has used that early version of a "food truck" when he and Oliver Loving drove their first herd of cattle northward out of Texas along what would become known as the Goodnight-Loving Trail (1866) . . .
would effect us this way? and their voices in our heart. P.S. . . . as an additional tidbit . . . on this date in the year 1899 . . . Noah Smithwick dies in California . . . but back in 1850 he was also living in Milam County, Texas . . . and on the 11th day of September in that year, he was also enumerated by T.J. Allen . . . this Noah Smithwick is the author of Recollections of Old Texas Days . . .
On this date in our family history . . . the 20th day of October . . . in the year 1650 . . . Mary Farnum marries Daniel Poore in Massachusetts . . . some sources say they married in Andover . . . the text shown below says they married in Boston . . . this Daniel and Mary are 9th great-grandparents to the Keeper of this family history blog . . .
On this date in our family history . . . the 16th day of October . 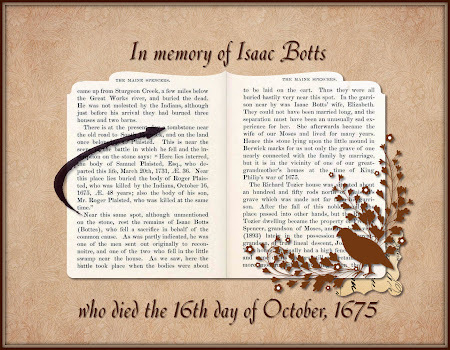 . . in the year 1675 . . . Isaac Botts is "One of the two who fell in the little swamp near the house." . . . this Isaac as well as the Benoni Hodsdon mentioned in the Plaisted letter are both 9th great-grandpas to the Keeper of this family history blog . . .
About an arrow-shot from Salmon Falls mill was the home of Elizabeth Botts and her first husband, Isaac. Here they owned twenty acres of land bordering upon Salmon Falls brook. . . .
Their movable possessions were meagre and for utility instead of decoration. The whole list comprises: a hog, a chest, an ax, some small dishes, an iron pot, a frying-pan, a spinning wheel, a saddle, and a harrow. This shows with how few luxuries young married people of 1675 could find life worth living, and enjoy it at the same time. . . .
With Isaac and his wife was their only child, Elizabeth, who was but a few years old. She afterwards married Samuel Brackett of Berwick, and lived on a farm adjoining her mother's later homestead. . . . Lieutenant Plaisted . . . wrote and sent the last letter he should ever compose. . . . "Salmon Falls, October 16, 1675. . . . No aid came in answer to this message . . .
Near this same spot [the grave of Plaisted], although unmentioned on the stone, rest the remains of Isaac Botts (Bottes), who fell a sacrifice in behalf of the common cause. As was partly indicated, he was one of the men sent out originally to reconnoitre, and one of the two who fell in the little swamp near the house. As we saw, here the battle took place when the bodies were about to be laid on the cart. Thus they were all buried hastily very near this spot. In the garrison near by was Isaac Botts' wife, Elizabeth. They could not have been married long, and the separation must have been an unusually sad experience for her. She afterwards became the wife of our Moses [Spencer] and lived for many years. On this date in our family history . . . the 12th day of October . . . in the year 1682 . . . Robert Goodell [aka Robert Goodale] makes his mark on his will . . . according to The Ancestry of Lydia Harmon, Robert died sometime between this date and the 27th day of June of the following year . . . which is when his will was proved in the courts of Salem . . . this Robert is a 10th great-grandpa to the Keeper of this family history blog . . . I, ROBERT GOODELL being now aged and weak in body, as also my wife and my daughter Elizabeth Bennett, hath taken care of me, and therefore my will and desire is, and I do will and bequeath unto my Daughter Elizabeth Bennett, and my grandchild John Smith, my house and the orchard and all the meadows that I now possess with the pasture which is about eight acres of upland be it more or less, all which land and meadows, my daughter Elizabeth Bennett and my grandchild, John Smith, shall enjoy after the lease, or term that is now let for, is expired, they or either of them paying as much rent, yearly as the wife of the above said ROBERT GOODELL hath let it, for which is to the value of twenty shillings in current pay?" dated the twelfth of October one thousand six hundred eighty two; and after my daughter Elizabeth's decease, the whole lands shall be my grand child's John Smith. In witness whereof I have hereunto set my hand and seal. On this date in our family history . . . the 11th day of October . . . in the year 1732 . . . Moses Tyler dies in Essex County, Massachusetts . . . and is laid to rest in the ancient cemetery in West Boxford . . . this Moses Tyler is an 8th great-grandpa to the Keeper of this family history blog . . . The above image is from page 40 of Volume I of The Tyler Genealogy by Willard Irving Tyler Brigham . . . the text about Moses Tyler reads as follows . 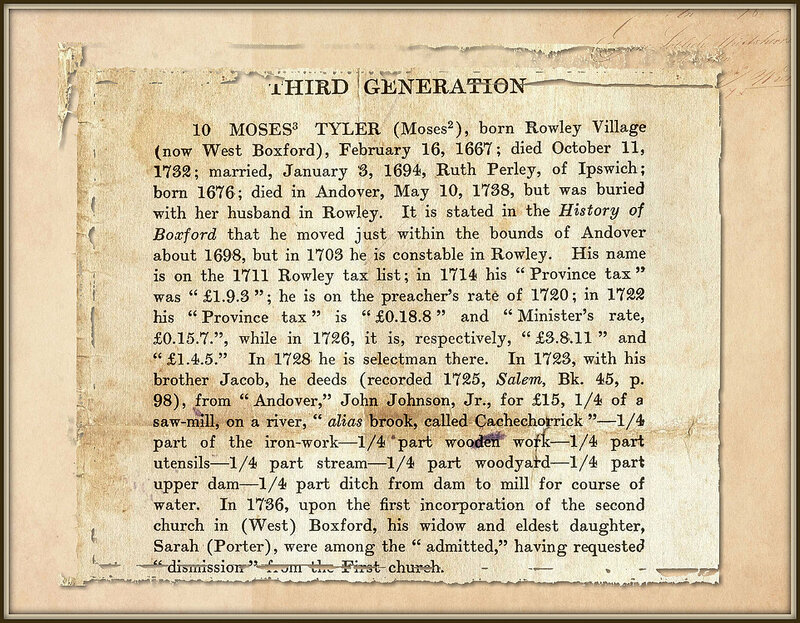 . .
Moses Tyler, born Rowley Village (now West Boxford), February 16, 1667; died October 11, 1732; married, January 3, 1694, Ruth Perley, of Ipswich; born 1676; died in Andover, May 10, 1738, but was buried with her husband in Rowley. It is stated in the History of Boxford that he moved just within the bounds of Andover about 1698, but in 1703 he is constable in Rowley. His name is on the 1711 Rowley tax list; in 1714 his "Province tax" was "£1.9.3"; he is on the preacher's rate of 1720; in 1722 his "Province tax" is "£0.18.8" and "Minister's rate, £0.15.7. ", while in 1726, it is, respectively, "£3.8.11" and "£1.4.5." In 1728 he is selectman there. In 1723, with his brother Jacob, he deeds (recorded 1725, Salem, Bk. 45, p. 98), from "Andover," John Johnson, Jr., for £15, ¼ of a saw-mill, on a river, "alias brook, called Cachechorrick" — ¼ part of the iron-work — ¼ part wooden work — ¼ part utensils — ¼ part stream — ¼ part woodyard — ¼ part upper dam — ¼ part ditch from dam to mill for course of water. In 1736, upon the first incorporation of the second church in (West) Boxford, his widow and eldest daughter, Sarah (Porter) , were among the "admitted," having requested "dismission" from the First church. On this date in our family history . . . the 8th day of October . 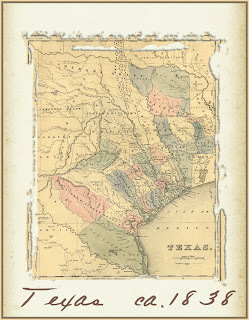 . . in the year 1838 . . . in the Republic of Texas . . . Mahala Lee Sharp nee Roberts is twenty-one years of age when her brother-in-law, Samuel Tabor Allen, is killed in Navarro County during The Surveyor's Fight (aka Battle Creek Fight) . . . at the time of his untimely death, Sam was married to Mahala's older sister, Matilda (1808-1879) . . . Sam was an early citizen of Viesca (later Milam County), and is mentioned in the pages of Texas history at tshaonline.org . . .